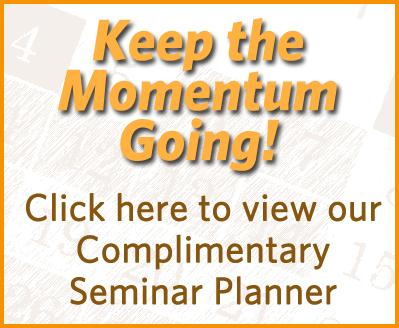 Two years ago a very successful annuity seminar agent began aggressively recruiting me to the seminar business. I was very impressed by his achievements and I began to show some interest in the business. He knew I had the financial planning and investment experience as well as many years of public speaking behind me. What he did not know was that I also had been the co-founder of two successful direct marketing companies that had been extensively involved in direct mail campaigns. After observing this man's seminars and operations it became obvious to me that success, in this multi-faceted business, required a mix of different abilities. The ability to speak effectively was important, extensive investment knowledge and expertise was clearly necessary, ability to close was essential, and the final critical component was getting people to the seminars in the most cost effective manner possible. In other words, direct marketing knowledge was also necessary. When I finally decided to get involved, it was under a contract where the company paid for my mailings and I paid for my meals and all other expenses. In return for my training and mailing costs being covered, I gave up a portion of my street level commissions. I did not see the mailer the company was using until I had already signed the contract. Once I saw their mailer, I wanted to call my attorney and have him cancel my contract! The mailer they showed me was a simple over-sized post card with very little information. Everything I was accustomed to in direct mail was much more sophisticated, complex, and professional in appearance. I told them that I was extremely skeptical and wanted to rethink our deal now that I had seen their mail piece. We finally worked out a compromise. Basically I would give their mailer a chance for three seminars, and if I was not totally satisfied with the results they would pay for whatever competitive mailing piece I wanted to use without changing our deal in any way. I have to say that, at this point, I was very surprised this agency had reached the absolute top of the industry with their simple mailer. However, since they had agreed to use any mailer I chose after the first three seminars, I focused on learning my seminar and getting my office set for business. I did, however, start to collect marketing materials from direct mail companies. In my mind, there was no doubt that after the first three seminars I would be switching to one of those "professional direct mail" companies. Three weeks later I gave my first seminar. Only 2,000 mailers had been sent out and there were 35 people in the room! I made 12 appointments, which was 75% of the buying units in the room. 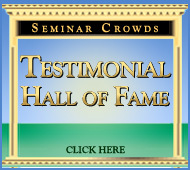 I wrote $410,000 in premium from that seminar. 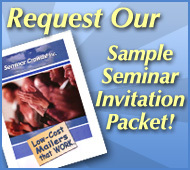 My next seminar had 30, again with 2,000 mailers, and the third seminar was about the same. I never brought up the issue of changing mailers again! Over the next few months, I conducted informal surveys among my clients about the mailers they were receiving from my competitors. I wanted to know why they had come to my seminar. I wanted to know what it was that made them respond to our simple mailer and why they did not respond to the more sophisticated and expensive mailing pieces. I also wanted to see if it was less sophisticated (and less wealthy) prospects that were responding to my mailer. You can totally forget about the big envelopes with coupons, etc. The wedding style invitations are a waste of money! The less your mailer looks like a professionally produced promotional piece the more effective it will be. In other words avoid glossy card stock and multi-colored printing. Keep the wording to a minimum. The beauty of the postcard mailer is its simplicity. You don't want to cram it with words. Don't make it sound as though your seminar is going to be difficult to understand. Avoid terms like "a mathematical model for investing will be presented". Emphasize the free meal and find good restaurants that attract the type of person you want as your client. The people who are doing the most annuity business in this country are using the higher quality restaurants. Do not use bulk mail; it is too risky for this business. If your card mailer is small enough you can get the first class rate for postcards. Always put your company's address as the return address. Most direct mail companies will not do this for you. To summarize, my experience over the last two years has proven to me that my initial negative reaction to the simple card mailer was totally unfounded. My more sophisticated (and more wealthy clients) continue to tell me that they are turned off by the obvious promotional direct mail pieces. They are especially turned off by the pieces that try to look like express mail or something other than what they really are. They tell me that they are much more likely to respond to a simple card mailer that does nothing but communicate the necessary information in a simple and honest manner that they can understand. They seem to appreciate the straightforward manner of the card mailer, which is doing nothing more than providing them information about an event that they may want to attend.